Mr. Incredible is a superhero with great strength and durability. In his everyday life, he goes by the name Bob Parr. 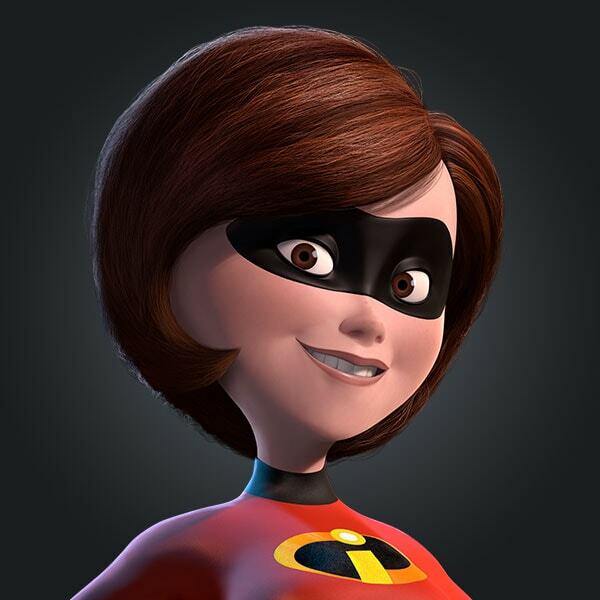 Helen Parr, known as Elastigirl in the golden age of superheroism, is a resourceful and dexterous superhero. 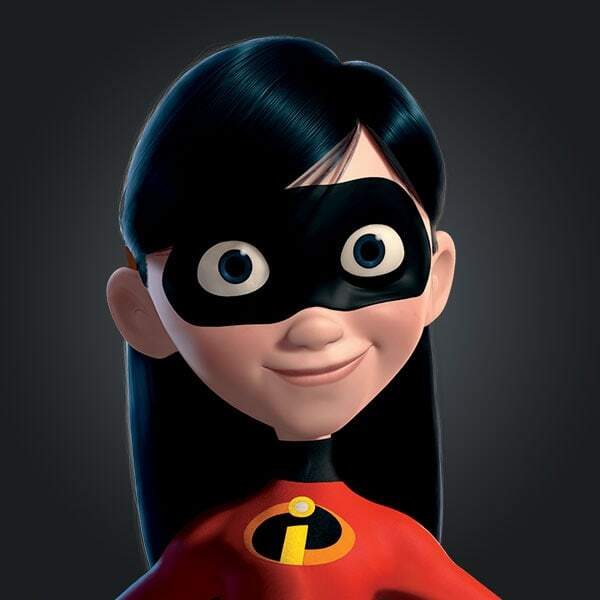 Violet Parr is the daughter of Bob and Helen Parr. She has the ability to produce force-fields and turn invisible. 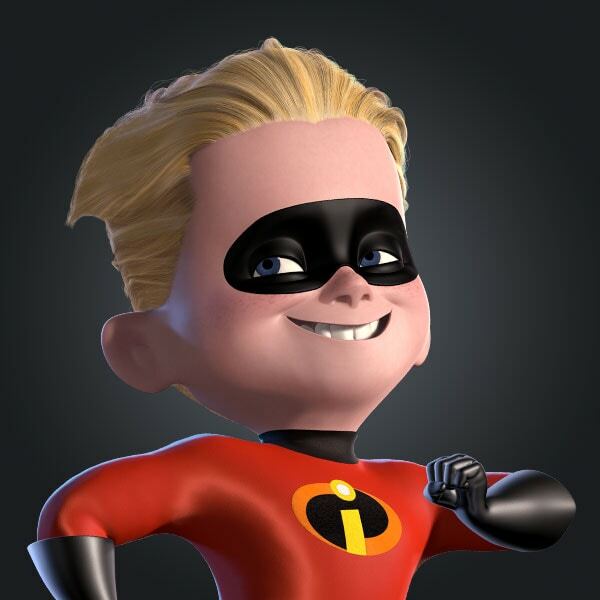 Dashiell Robert "Dash" Parr is at age 10 the elder son of Bob and Helen Parr. He has the ability to move at great speeds. Saving the world is kind of his thing. Syndrome’s invention is let loose on the city. Mr. Incredible reminisces about his blue-suit days. This number one fan takes being a super into his own hands. Mr. Incredible has a hard time getting past Syndrome. "Leave the saving of the world to the men? I don't think so." Protecting a super’s identity is a top priority. Edna has a spark of inspiration for a new super suit. Mr. Incredible’s workouts can involve freight trains. The Incredibles are on their way to confront Syndrome and the Omnidroid. Mr. Incredible’s strength is pitted against the Omnidroid’s. Violet and Dash learn how to work together as supers. Mr. Incredible and Frozone are super pals that go way back. Mr. Incredible is ready for his next assignment. Growing supers like Dash take big bites. Car-lifting is not the average thing a neighbor sees every day. Bob is ready to burst out of a frustrating situation. Bob tries to help wherever he can. The Incredibles are united when they confront Syndrome. Quality bonding time can get a little chaotic with a family of supers. This teenage super plays a key role in taking down the Omnidroid. Frozone gives Dash a lift while making it hard for the Omnidroid to follow. This little one isn’t quite ready to show off his powers. Bob and Jack-Jack are a pair of smiling supers. This super cools off the fight against the Omnidroid. Violet and Dash are all smiles after meeting up with their dad. This designer will never let a super be dressed in anything but the best. This young super finds that running fast can come in handy. 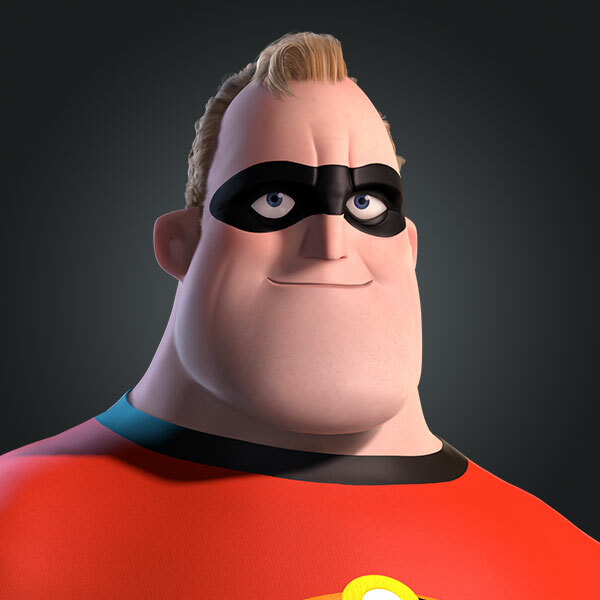 Syndrome keeps The Incredibles at bay with his zero gravity tool. Bob is encouraging when Violet tries a new hairstyle. The Incredibles and Frozone are one super team in defeating the Omnidroid. Frozone uses his icy powers to stall the Omnidroid. Give your ''Incredible Mom'' super powers at <i>Walt Disney World</i> Resort with this mighty MagicBand 2 design. With a simple touch, redeem FastPass+, enter parks, charge purchases to your room, and more!